Length overall. . . . . . . . . . . .
Beam. . . . . . . . . . . . . . . . . . . . Draft (engine up) . . . . . . . . .
Cabin headroom. . . . . . . . . .
Power. . . . . . . . . . . . . . . . . . .
Fuel capacity. . . . . . . . . . . . . Weight (w/o engine). . . . . . . Speed. . . . . . . . . . . . . . . . . .. . Range. . . . . . . . . . . . . . . . . . . This larger planing dory makes a great beachable island cruising boat with plenty of room for people and gear. Move away from summer mobs, noise, gas consumption, and air pollution in an elegant, fast dory from NEXUS. Wherever you want to go, this dory will speed you there quietly. In this design, we used the inherent advantages of modern wood construction to create a hull that moves through the water very easily. A 45 HP 4-cycle outboard will give you speeds of up to 25 knots and incredible fuel economy. Trailering weight, including boat, motor, and trailer, is only 2800 lbs. Compare these figures to any other 23' boat! This is a safe boat, too. The cockpit is self-bailing. The NEXUS 23' Dory's engineered structure feels solid and strong. A light, stable hull form, high freeboard, and high cockpit coamings combine to make this an exceptionally seaworthy vessel. The cockpit's big enough for any activity. Bare, solid fir floorboards cover the self-bailing cockpit sole for good footing and easy care. A water-tight access hatch runs down the center. The outboard is isolated by the huge splashwell and optional sound-proofed motor cover. Inside the cabin, the theme of simplicity and beauty continues. A clear marine finish welcomes you. There are no raw fiberglass edges, no cheap carpeting covering the hull. Wood is warm to look at, warm to the touch, warm to the heart. The cabin includes a V-berth, galley cabinet, and a seat opposite that can hide a Porta-Potti. Adding the optional insert produces a double berth. There's lots of room for stowage under the berth. You can cook or read charts on the counter top. Open the solid bronze ports, enjoy the view out the large safety glass windows, and stay cozy and dry. 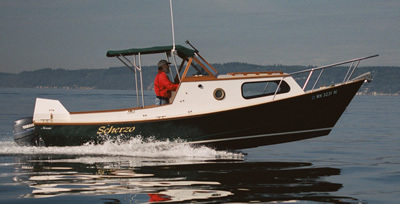 The NEXUS 23' Dory - a boat with comfort and practical beauty that you'll be proud to own. We are located on the Snohomish River in the Pacific Northwest, about 20 miles north of Seattle. Click here for a map to Nexus Marine Corporation.